This garlic fried chicken breast recipe works well for lunch and as a light dinner. When I'm hungry for a sandwich, this is one of my favorite chicken recipes. I usually serve my chicken breast on toasted buns, with honey mustard, lettuce, onions and tomatoes. Oh this sounds so so delicious. This is my go to recipe when I'm craving for a chicken sandwich. Instead of buying a fast food chicken sandwich, I get in the kitchen a fry up some chicken myself. Taste so much better this way. Do you agree? What I really like most about this recipe for garlic fried chicken breast is the fact it's easy to prepare and cooks up in about 25 minutes. 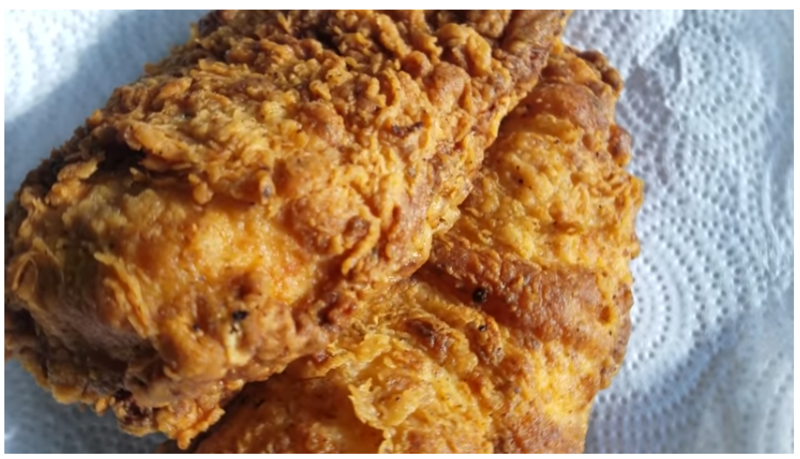 Here are the simple instructions for how you can cook garlic fried chicken breast. Enjoy the recipe! You will need the following ingredients and cooking utensils for this recipe. You can use fresh or frozen chicken as the main ingredient to this chicken breast recipe. If you use frozen allow for ample time to thaw the chicken. Start by pounding each chicken breast to an even thickness so it cooks evenly. Go ahead and rinse your chicken under running cold water. Pat chicken breast dry with paper towels and set aside. To make flour mixture, add all dry ingredients to a brown paper bag or plastic big. Close bag and shake to get a uniform mix of the dry ingredient, set aside. In a small mixing bowl whisk together your egg and milk. Dip each chicken breast into the wet mixture, then thoroughly coat with the seasoned flour and set aside. Add about 1 inch of vegetable oil to a heavy bottom or cast iron skillet and heat on medium high until sufficiently hot. Test the cooking oil by tossing a drop of water into the skillet. If the oil crackles or pops it's ready for cooking. Depending on your stove, you may have to adjust the temperature up higher. Add the chicken breast to the skillet. Do not overcrowd the skillet this will only hamper your cooking efforts. Cook chicken breast uncovered for about 5 minutes on each side, turning only once. The chicken breast is done when it center has reached an internal temperature of 160-165 degrees. I'm sure you're going to enjoy this garlic fried chicken breast recipe, as much as we do, for many years to come.